Amazing Artistic Photo Effects - Dealjumbo.com — Discounted design bundles with extended license! 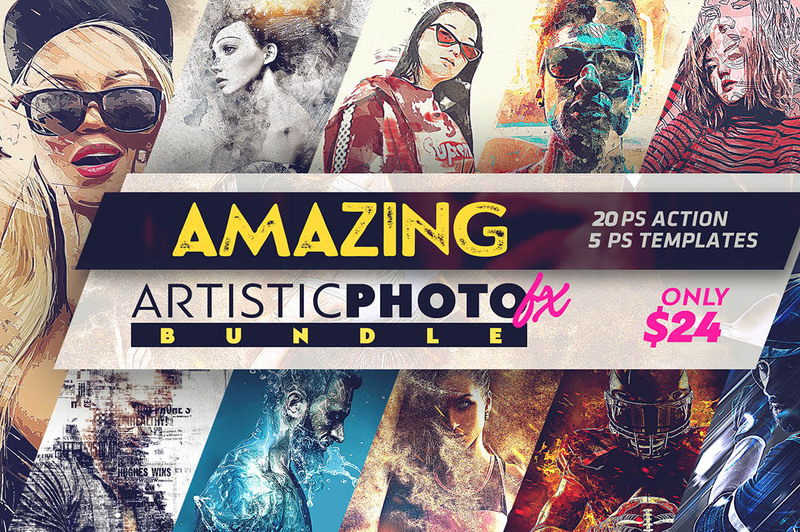 Amazing Artistic Photo Effects - Dealjumbo.com — Discounted design bundles with extended license! 5 creative Photoshop (PSD) templates! 20 amazing Photoshop actions & 5 creative Photoshop (PSD) templates! extended license (like all of our deals): use for unlimited personal and commercial projects + you can also use them in designs/products that you sell. You can use all these items as a part of your non-digital or digital designs ( posters, t-shirt designs, stickers, web templates…). You cannot resell these files directly, or within items/goods where they can be extracted in their original form (like vector shapes, elements, fonts… – they need to be flatten into background or object in your digital item for sale). License is only for 1 person – you’ll need to buy 2 licenses if 2 persons will work with these graphics! Normally, all these actions & templates would cost you $250 (without extended license! ), but for a limited time only, you can get this unique collection for $24!